This past October the Black Gold Quilt Patch (based in Leduc) had their biannual fall quilt show. I was very busy getting many quilts done for customers, my mom Betty and myself. 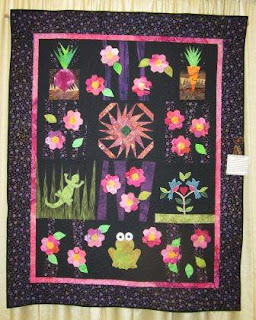 This is a quilt I finished in time to put in the show. I got the quilt top done last year but it sat unquilted like so many of my quilt tops do. My mom had helped get the quilt top done for me last year. The block of the month or pizza box exchange was started over two years ago with 9 ladies. We each got a box and put some fabric we wanted used into the box. All of the blocks were to be 12 1/2". I also put a little note book so the ladies could write about the block they used. I put black, and other brights in my box and asked for garden theme blocks. I also added the English pieced blooms as they were leftover form another quilt that is done. Each month we would exchange the boxes and work on one block. I got behind at one time and had three boxes at my house. So bad. All the boxes did get done. Many of the other quilt tops have not been done yet. One was sewn up and given to charity quick quick. My mom's quilt is done and one other got done. I used a black wool fabric for batting. It is a heavy little quilt. 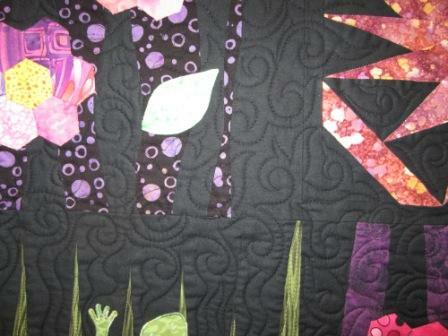 I have quilted the black with a curly vein pattern that I do free hand. I hope you have enjoyed seeing it finished finally. 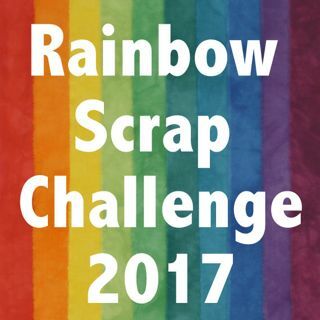 If you want to see more about the project check out Block of the month for the older posts. Happy USA Thanksgiving. Here in Canada we have to work today. We do have some sale this week. 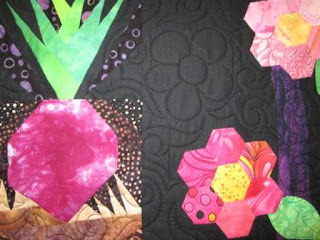 I love the colors Cathy-the different blocks are each so lovely. The free hand quilting is a great design on the quilt. Congratulations on completing it.